I am so excited to be posting for the first time on our very own site. When I started this blog, I originally predicted I would get discouraged and abandon it after a month. It was my intention to give myself six months before making the commitment of buying a domain name and designing a self-hosted site. My enthusiasm must have been contagious, however, since Geoff decided to go ahead and start working on this site for me. And for you. After just two months, we’re totally psyched to share it with you. I probably should have made you something more extravagant, like a giant cake, but this is still real life. And that’s what we’re about. Austerity is back in effect after some unexpected financial setbacks (stolen scooter), along with some other budget busters (hello immigration). Simplicity shall reign over indulgence for a good long while, it seems. That doesn’t stop me from sharing sugar-encrusted muffins with you, though. These fluffy sweet gems were born out of a combination of resourcefulness and an utter lack of attentiveness whilst in the grocery store. With a base recipe for muffins to test and an extra bag of butterscotch chips, I managed to produce something brilliant. This is a muffin. It is not a frostingless cupcake. It is more substantial, and has a lovely sort of crust all the way around. It’s still loaded with sweetness, though. The kind that makes you want to sing and dance. 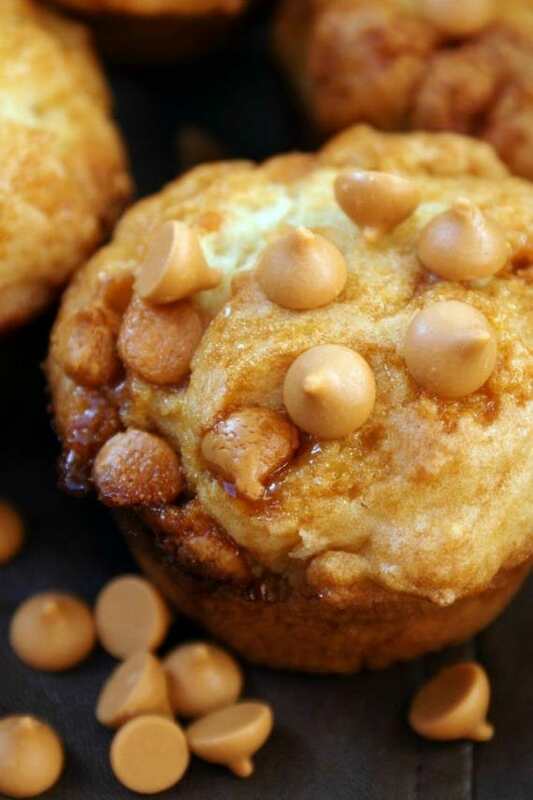 The butterscotch chips melt in the oven, forming delightful little burst of goodness, and the caramel sauce drizzled over the top before baking forms a gorgeous burnt crust around the edges. You absolutely must eat these warm. It’s totally fine to pop them in the microwave for fifteen seconds. I mean, they’re perfectly edible at room temperature, but the gooeyness is where it’s at. Do not miss out. They’re so worth the burnt fingers. Preheat oven to 375 and spray muffin tin with nonstick spray. Sift flour, baking powder, baking soda, and salt into a large bowl, or pulse in food processor for about five seconds. Whisk together sugar, oil, egg, egg yolk, and yogurt in a medium bowl. Add the wet ingredients to the dry ingredients and quickly and gently stir to combine using a spatula or wooden spoon. Some small lumps are okay. Try to accomplish this in 10-15 seconds. Scoop the batter into the waiting muffin pan. The cups will be quite full. 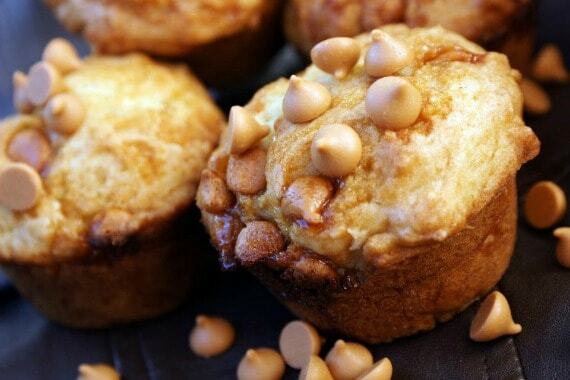 Muffin tops are the bees knees. 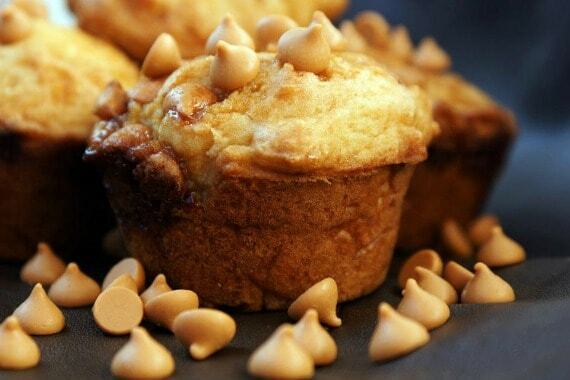 Drizzle a spoonful of caramel sauce over each muffin. Bake for 18 to 20 minutes, or until a toothpick comes out clean. Remove the muffins from them pan and turn them on their sides on a wire rack to cool. This will give you that lovely crust all the way around. Serve warm, even if it's a day or two later. Good luck not burning yourself. I miss them. And I miss you! I miss you, too! Now you have the recipe so you can make them yourself. 🙂 Thanks for the amazing photos! I love these muffins and the new site is fabulous! Thank you so much for stopping by. I hope you love the muffins. They’re pretty wicked! Mahalo!!! Can I substitute the yogurt for sour cream? I’ve never tried it, so I’m not sure what the results would be, but they have similar water content and acidity, so it should work. Let me know how it goes.